To promote energy use 4. Course of biomass heater installation, for management of maintenance and provisioning. MYCOLOGY To promote mycologic control and regulation 6. Disposition to collaborate in the project Myas RC. PATHS AND ROADS To improve the maintenance and signposting 7. Inventory of tourist resources and products. 10. To measure the balance of CO2 in our territory. 11. To ask electric power companies for compensations because of the effect that filters and is retained caused by the mountain in the water that supplies reservoirs. 12. To associate in order to analyse the drain effect: revitalising the participation in forums to explain to society the role of the mountains as drains, acknowledging the role of mountains as drains for possible compensations on the part of the owners, reinvesting, this way, in possible compensations because of the drain effect when reforesting, influencing the payment for environmental services, acknowledging the forest sector within the PNADE (National Plan of Assignment of Emission Rights). • Voz de Pinares. (newspaper) 13. To celebrate once a year the Model Mountain Urbión’s day with activities related to the environment (such as forest management and environmental quality, uses and exploitation, proffesions connected with the environment,...). Activities for groups of adults as well as children with the possibility of rotating among municipalities. 14. It would be interesting to incluede n the program of the festivals organized by partner councils a sentence like the following “Your hometown is in Monte Urbión, if you take care of him, he will protect you”. 15. One week exchange between groups of scholars of our region and other groups who live in cities. People and entities that visit the region • Universities. • Web of the association. • Partners. 16. To design the content of an informative module about forest association and management of the region for people with no forest knowledgge, with a duration of ½ an hour using paper and video means. The video will reproduce the paper’s content, which will be shown in the region. 17. To design the content of an informative module about forest association and management of the region for people with forest knowledgge, with a duration of 1 hour using paper and video means. The video will reproduce the paper’s content, which will be shown in the region. 18. To design a guided route explained in the informative module for people with no forest knowledge. 19. To design a guided route explained in the informative module for people with forest knowledge. People and entities from outside the region • Regional networks of model forests. • Profor. 20. 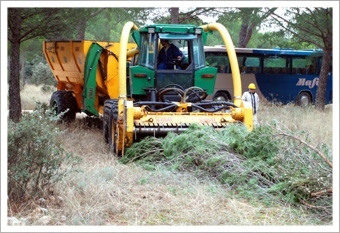 To take part in the Mediterranean Model Forest Network. 23. To take part in the forest congress of CYL. 24. To take part in the national forest congress. General • Houses in parks. • Partners. 25. Edition of a three-page leaflet about the association and the region should be didactic and legible. 26. Design and execution of 2 roll-up to use in events in which the association takes part. 27. Apply to be “Reserve of the Biosphere”.